The other day I heard a few people use the term “quantified self”. Through Wikipedia I learned that the quantified self stands for “a movement to incorporate technology into data acquisition on aspects of a person’s daily life in terms of inputs, states, and performance.” In other words, this is all about quantifying peoples’ lives and behaviours, thus being able to learn more about people and their different activities and needs. 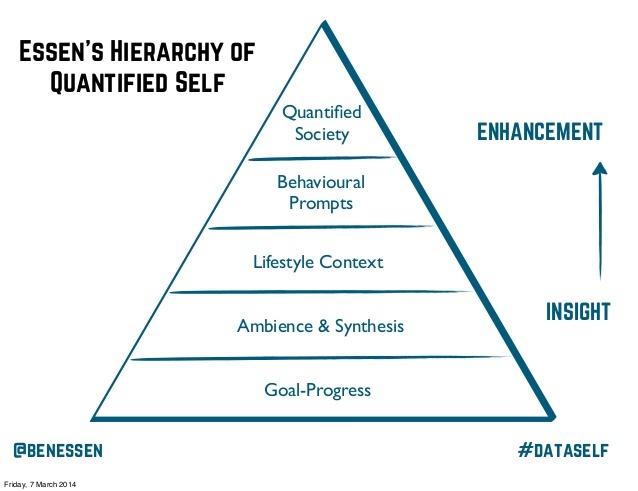 Essen’s Hierarchy of Quantified Self – Similar to Maslow’s Hierarchy of Needs, Ben Essen has come up with his own “Essen’s Hierarchy of Quantified Self” (see Fig. 1 below). Ben’s hierarchy starts with “goal-progress” (e.g setting daily goals with apps such as Fitbit and Wello) and ends with the “Quantified Society” where everything is informed by our personal data. I like how Ben’s ‘pyramid’ moves from “insight” to “enhancement”, thus highlighting the changing role of personal data as one moves up along the hierarchy. Context-driven measurement – Melon is a great example with regard to quantifying personal data within a specific context. For instance, with Melon you can track how focused you are when you’re working on your laptop compared to when you’re meditating (see Fig. 2 below). Ben refers to this as “lifestyle context”, which implies that your personal data are likely to vary dependent on your mood or the activity that you are doing. Another good example is Nest which home products are designed to learn from user behaviour. I’ve written a few posts on wearable devices and wearable trends to look out for. 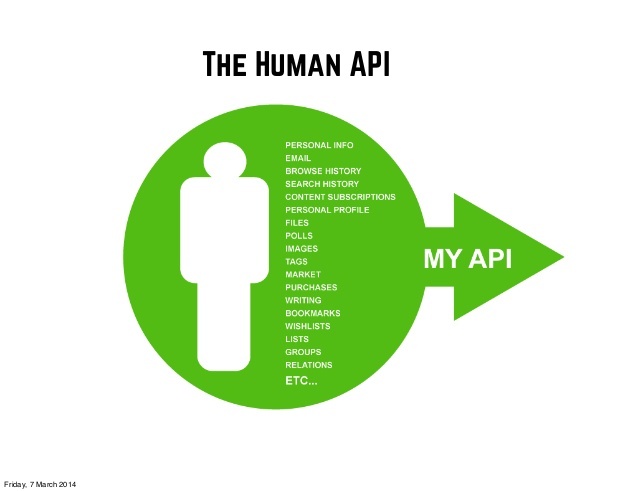 “The Human API” – Ben ultimately envisages a ‘Human API’ which encapsulates all your personal data, irrespective of the underlying data source (e.g. email, browse history, search, etc. – see Fig. 3 below). I’ve been trying to visualise an API of all my personal data (e.g. “went to a Danny Brown gig last month, purchased “The Mindful Leadership” on his Kindle and checked in with his Oyster in north London this morning”) and how a brand or other 3rd party would tap into this data set. This concept provides both opportunities (e.g. fully personalised experiences) as well as risks (e.g what happens if my Human API falls into the wrong hands?). Connecting data sets and devices – I strongly believe that the next frontier in digital development is the connection of different devices and the connection of a user’s various data sets. The possibilities are endless, but I reckon it will take a while to properly connect personal devices and data, thus creating a ‘personal platform API’ similar to the “Human API”, as mentioned by Ben in his talk at SXSW. Main learning point: Ben Essen has got a lot of interesting and thought-provoking insights around the topic of the “quantified self”. We are moving steadily in the direction of a society where a lot our behaviours, mood states and activities can or have already been quantified. The idea of a quantified self and a “Human API” will in my opinion truly materialise once we all get smarter about how we connect different devices and data sets. In the meantime, I suggest looking into some of Ben’s observations and reservations around self-tracking and have a think about about how we can move up “Essen’s Hierarchy of Quantified Self”.